This is a brain tickling magazine packed with a number of challenging puzzles with big prints. Bumper Big Word Search magazine is a UK based and comes with twelve issues per year. Buy a single copy or subscription to Bumper Big Word Search magazine. This is a brain tickling magazine packed with a number of challenging puzzles with big prints. It is a UK based and comes with twelve issues per year and has established itself as one of the most bought magazines when it comes to the word juggling. 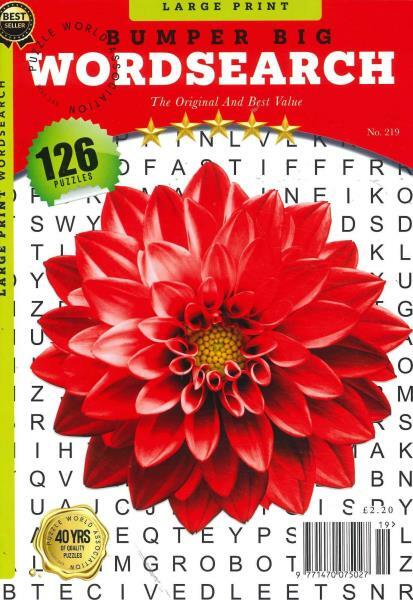 The puzzles contained in the magazine, not only add to one's ability to juggle through the words but also aids in enhancing the word base of each individual. It embodies puzzles which are based on a number of domains, covering every sphere of life and education. The nursery words, the names of the pets and other animals, the branches of medicines, terms in connection with culinary and other diverse topics act as the underlying themes for these well designed word search puzzle. The magazine aims at establishing a connection with each and every member of the family. It certainly provides something of value to each and every member from all the age brackets. The kids, youngsters as well as the old grandparents enjoy grabbing a copy of this fun-filled magazine. The magazine certainly promises its readers hours filled with excitement and invaluable puzzles. The layout of this magazine is kept simple, with a prime focus only on the content which it surfaces. The cover page is plain and sober, with themes based on current scenarios. The puzzles contained in the magazine are of superior quality both in terms of print as well as knowledge.